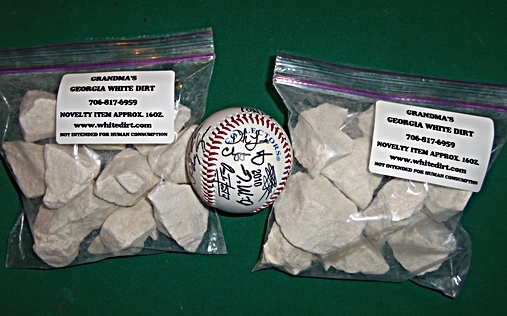 White Dirt of Georgia - Home of the Original Grandma's Georgia White Dirt. It's Easy To Save Money With Grandma. Just Click The Button! WAIT!! Your SECRET Word Until April 30 is "BLISS"! Type your SECRET WORD into the Coupon Box at Checkout and You Will Receive 15% OFF Your Entire Order. It's Like Getting Some FREE DIRT! Some of the more official names of white dirt are clay dirt, white clay, kaolin, porcelain clay, china clay, chalk, or the long winded scientific name aluminum silicate hydroxide. Whichever name you choose, it's still white dirt. There are many uses for this natural product. Kaolin (white dirt) is used medically to treat diarrhea, dysentary, cholera, and is also used in paper making, paint, fiberglass, porcelains and ceramics, china, and toothpaste. Some of the most popular products that have been made with kaolin (white dirt) are Kaopectate, Rolaids, Di-gel, Mylanta, and Maalox. Some people have actually been known to eat Clay Dirt regularly and not only like the taste but crave it. It has been said that the taste of white dirt is akin to the fresh way that the ground smells when it's real dry and a little sprinkle of rain falls. Clay -Dirt-eating is an ancient tradition that is practiced all over the world and although the demise of the practice has been predicted for many years, it still persists, particularly in rural areas of the South. "Geophagy" the scholarly term for clay-dirt-eating, is practiced by both blacks and whites but is most commonly associated with black women, particularly during pregnancy. The clay-dirt-eating tradition appears to have been handed down from generation to generation and several years ago it was not uncommon to see women gathered together to eat a pan of clay dirt. "Though the practice is rarely if ever recommended by medical professionals, some nutritionists now admit the habit of eating clay dirt may have some real health benefits. "It is possible that the binding effect of clay would cause it to absorb toxins," said Dr. David L. Katz, nutrition expert at the Yale School of Medicine and a medical contributor for ABC News. Clay's ability to absorb plant toxins is well documented. Jared Diamond, professor of geography and physiology at the David Geffen School of Medicine at UCLA and author of "Guns, Germs, and Steel: The Fates of Human Societies" has written on clays that are especially good at binding with plant toxins." You can read the complete article by clicking here. White Dirt (kaolin) has also been used as a natural, chemical free shampoo. Begin by soaking about 4 ounces of white dirt in water. After about 2 hours the clay will absorb the water and become soft and pliable. Mix the clay thoroughly so that all the lumps are broken up and it becomes a smooth, thick paste. Gently rub this paste into your scalp and hair, applying as you would an ordinary shampoo. Rub for about 5 - 7 minutes, then rinse. If you feel the need, you can rinse, then re-apply the paste before the final rinse and wash off. According to information available on the web, you should use this kaolin shampoo twice a week and your hair will be as smooth as silk. Your hair will reportedly feel better and be softer, smoother and silkier than when treated with commercial conditioners. Because Grandma's White Dirt Brings You A Warm Smile And A Moment Of Joy! Our Diggers Actually Go Down To The Mine For Your Dirt. I Appreciate You Ordering From Us And Being Our Customer! Should You Dry Your White Dirt? To A lot of our customers heat their White Dirt to sterilize it. I recommend that you sterilize your dirt to kill any germs/microbes that it may contain. Grandma's White Dirt is dug directly from the ground and is unprocessed. To Microwave: Dry on High 3-8 minutes in a paper bag that has been folded end over end creating a pouch, as the dirt heats up rapidly with this method, it expands and pops all over the place. The bag end over end saves you from cleaning up a big mess! For A Conventional Oven: Dry at 350 degrees for up to 60 minutes on a cookie sheet/pan. The length of time in the oven determines how dry the dirt is and how dry you want it. You will need to test different times to get your White Dirt just right for you. Watch your White Dirt closely, no matter which method you use to dry, it will burn! The more drying time the White Dirt gets, the crunchier it tends to be! You can store your White Dirt in a paper bag for the best results.No matter how you store your White Dirt, you must store it away from odors as it will soak up smells and tastes just like baking soda. Discreet Shipping On All Orders! The products and the claims made about specific products on or through this site have not been evaluated by WhiteDirt.com or the United States Food and Drug Administration and are not approved to diagnose, treat, cure or prevent disease. The information provided on this site is for informational purposes only and is not intended as a substitute for advice from your physician or other health care professional or any information contained on or in any product label or packaging. You should consult with a healthcare professional before starting any diet, exercise or supplementation program, before taking any medication, or if you have or suspect you might have a health problem. Information about each product is taken from the labels of the products or from the manufacturer's advertising material. WhiteDirt.com is not responsible for any statements or claims that various manufacturers make about their products. We cannot be held responsible for typographical errors or product formulation changes. Due to possible health concerns, we advise against eating dirt. The product that we sell is labeled "Novelty" and the label warns: "Not suggested for human consumption." No sales to anyone under 18 years of age. Every good and perfect gift is from above. White Dirt of Georgia is owned and operated by Sam's General Store and, to protect your privacy, your credit card statement will show a charge from this vendor.. We have been in business at out present location in White Plains, Georgia since July 1975. My goal with this website is to deliver our Georgia White Dirt to anyone in America that is interested in our product. Your business is appreciated and if you are concerned about our being a legitimate business, call me any day before 7PM Eastern Time. The phone number is 706-817-6959. My name is Sam and I'll probably be the one to answer the phone. Thanks for visiting! Copyright © 2012 Sam's Geneal Store. All Rights Reserved. Built with Volusion.